With over 100 injuries reported, video from the commuter transit train crash in Hoboken Terminal, New Jersey, shows mangled train carriages, twisted metal and a partially collapsed ceiling. An eye witness said the train didn't appear to slow down. The video shows the mangled train carriages from the front of the New Jersey transit train that is alleged to have jumped the rails and plowed into the wall of the Hoboken train terminal during the early morning commute on Thursday. In the footage, part of the ceiling appears to have collapsed on the station platform while transit workers check inside the first carriages of the train. Water is pouring from the ceiling and there are multiple hanging wires. A woman is heard screaming. The transit hub in Hoboken is seven miles from New York City and is a busy commuter site for travelers to and from the city. The accident happened during rush hour. More than 100,000 people use New Jersey transit to commute to New York City daily. The crash left more than 100 people injured, with many in critical condition, NJ Transit director of media relations Jennifer Nelson said. 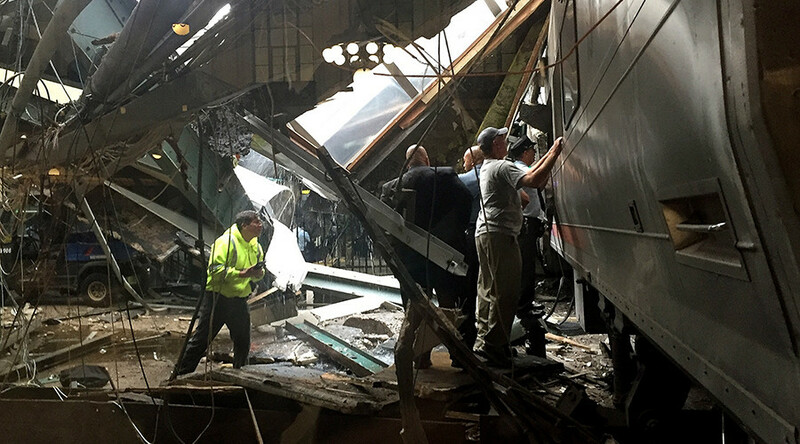 "My train just ran full force into Hoboken Station," Twitter user @jaydanahy wrote. Another user, @big_Poppa_Chop, wrote, "NJ transit train just crashed in Hoboken terminal." Most of those injured appear to have been riding in the first car or were at the station and were struck by debris. Police scanner confirmed one fatality, and said 75 to 100 passengers walked out with injuries. Passengers in the second car and further back were able to exit the train. Federal investigators are en route, according to Matthew Lehner, spokesman for the Federal Railroad Administration. New Jersey’s emergency management system is reporting more than 100 people were injured in the crash, and NJ Transit is reporting multiple passengers are trapped.